Traditionally, the beginning of the order of deacons is traced back to the story in Acts of the Apostles, Acts 6: 1-6. Whether this pertains to the history of the ordained order of deacons as they developed in the early centuries of the church is in dispute, but it is very much in the spirit in which the diaconate was and has been understood ever since. Very early in the history of the church, deacons were understood to hold a special place in the community, along with bishops and presbyters. The role of all ordained ministries is to be modeled on the life of Christ, and that of deacons especially was and still is, that of Christ the servant. Perhaps the earliest reference to deacons in this sense (ca. 53 A.D.?) occurs in St. Paul's letter to the Philippians in which he addresses "all the saints in Christ Jesus who are at Philippi, with the bishops and deacons". However, it would be a mistake to interpret the servant role too literally as one of "waiting on tables". One of the seven first deacons, Stephen, was stoned to death because of his bold preaching of the Gospel, Acts 6: 8-15, 7: 54-60 . He is the first recognized martyr of the church, and his feast day is celebrated on December 26. Of the remaining seven, those of whom we have historical knowledge, it is clear that their ministry also quickly broadened to preaching and spreading the Gospel message. "Two final segments: firstly my description of the semantic character of diakon- as applied to deacons in the early church (from Appendix I, Diakonia, p. 337). 5.0 The designation “deacon” does not derive from attendance at table but from attendance on a person. 5.1 This person is not the needy person or the congregation or community but the episkopos (the later “bishop”), whose “agent” the “deacon” is. 5.2 The word was chosen as a title of this Christian officer because the word had currency in religious language. 5.3 The title is not derived directly from non-Christian religious guilds, in which this common noun designated ceremonial “waiters”, but is an original Christian designation for an “agent in sacred affairs”. 5.4 The title probably originated in cult. [“cult” is the word I used then and, outside of the context of the study as a whole, is possibly misleading or mystifying; the intention was to register the regularly religious character of the usage... ]. 'Why did we say that only the bishop places hands on him? For this reason: because he is not ordained to priesthood [sacerdotium], but to ministry [ministerium (hypêresia)] of the bishop, that he will do what [the bishop] commands.'" As is well known, Vatican II cited this “not unto the priesthood, but unto the ministry” in Lumen Gentium. Thus it was understood that deacons were ordained not for any specific set of duties for serving the needy but to serve the bishop in whatever set of duties he would determine. The circumstances today are, of course, far different than in the early church. The size and complexity of the modern diocese makes such an intimate relationship with the bishop impractical. Although deacons serve in a wide variety of settings, including hospitals and prisons, the focus for today's deacon is normally parish based. However, he retains the historical tie with his bishop, whose "servant" he remains. The major point we should take from a study of early church history and the witness of the early Fathers of the Church is that they acknowledge the importance of the diaconal ministry. Saint Ignatius of Antioch, about 100 AD, says that it would be impossible to have the Church without bishops, priests and deacons. He explains that their task was nothing less than to continue ‘the ministry of Jesus Christ'. It should be understood that efforts at renewal of the diaconate as a permanent and separate order came as early as the Council of Trent, which suggested this as part of the reform measures. The problem was, the implementation was left to the Popes, and none saw fit to implement this until Paul VI and Vatican Council II. 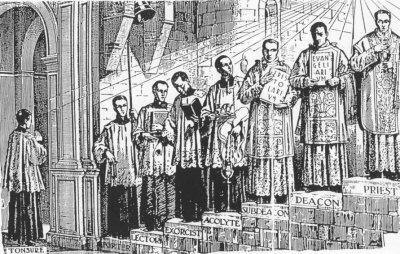 Modern movements toward restoration of the diaconate as a permanent order began as early as the middle of the 19th century, although most trace it to discussions by priests in concentration camps of the Nazis during World War II. These priests pondered the nature of the Church after the war, and suggested restoring deacons as an order devoted to service of the church and its people. Further articles by theologians explored this possibility and paved the way. In 1957, Pope Pius XII spoke favorably about restoring the diaconate as a permanent order, but concluded "the time was not yet ripe". And so we have come full circle. The permanent diaconate has proved to be a resounding success, growing at an astounding rate throughout the world, but nowhere so much as here in the United States. The theology of the diaconate has yet to be fully explored, but with the help of the Holy Spirit, it will mature. Comments and suggestions about the website may be directed to the webmaster, Deacon Bob Gurske at deaconbob@stbartholomewchurch.org. For information about the diaconate program in the Archdiocese of Newark, or questions about the diaconate in general, email us at john.mckenna@rcan.org.